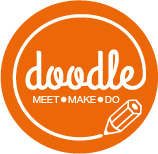 DOODLE meet . make . do! Adult art, craft & design workshops in, Reigate, Surrey. A relaxed and informal class to suit all levels & abilities! Local graphic designer Sarah Godsell will guide you through the rewarding process of lino printing. With a brief overview of the techniques and tools, Sarah will assist you in creating a completely individual piece of art work for you to treasure! 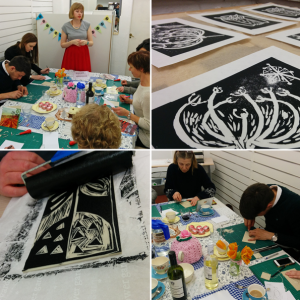 The class includes a demonstration on using the cutting tools and lino, how to get the best results with your image, inking up using washable ink and printing onto beautiful Japanese paper. To get the creative juices flowing delicious refreshments will be served in fine china, including scrumptious cake from popular local bakery Chalk Hills.